The webinar on Cloning Strategy is intended for all the market participants having a long term vision. It is a very interesting and easy to understand system which aims to replicate the performance of successful fund or fund managers. Many people have been knowingly/unknowingly following stock picks of renowned institutions and individuals but have not tried to create a process around the same. This one simple but major flaw has led to many investors making errors while picking stocks. This webinar is designed to teach people how they can create a process around cloning so that “unforced errors” can be reduced to a minimum leading to superior long term returns in the equities market. Introduction to the concept of cloning. Creating a process around cloning which is easy to understand for advanced traders as well as beginners. Helping you to become a successful investor in the stock markets for the long run. Karan has experience of more than 8 years as a trader & investor in equities & currencies and is currently working as manager of Family Office Funds at Kredent Capital. He has completed his CFA (US) in 2014. He has been involved in the research team at Kredent since 2009 and has worked under various roles over the years. Currently he is involved in the investing vertical at Kredent managing funds in the equity markets with a long term horizon. Besides equities market Karan also has a passion for travelling, exercising and football. An initiative which is highly praise-worthy. Let us keep doing such webinars on a regular fashion. 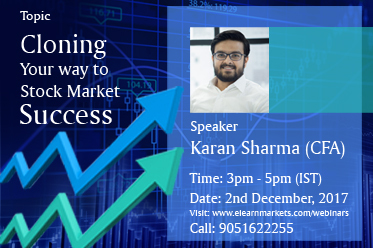 Its always interesting and amazing experience with elearnmarkets, make more webinars on equity research which make us much ahead than another average investor... Karan Sharma always a good teacher .... good to learn if he teaches valuation particularly DCF. Try to elaborate topic so that investors have a little bit of topic knowledge.